funny cartoons. For example, his dictum that bullfights weren't funny inspired director Chuck Jones to make Bully for Bugs (1953). But Selzer's ban on Tasmanian Devils came in the form of a direct order — after Devil May Hare was released on June 19, 1954, he made it absolutely clear that there were to be no more cartoons about a stupid-looking, unfunny character like that. And since he was the man officially in charge of the Warner Bros. cartoon department, the boss of all the directors working there, that was the end of the matter. But Selzer, too, had a boss. Jack Warner, the Warner Bros. mogul himself, had enjoyed Devil May Hare, and asked Selzer why that wonderful character hadn't been used again. 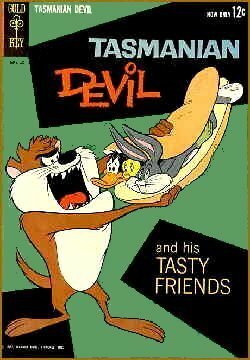 Selzer quickly issued new orders, and The Tasmanian Devil was back on the screen with Bedeviled Rabbit, which came out April 13, 1957. In both of those cartoons, his role was menace to Bugs Bunny. The third, which came out later that year, pitted him against Daffy Duck. Taz (as he came to be known much later) was appetite personified. His face was dominated by a mouth ringed with sharp teeth, and the rest of him was shaped like a funnel leading into a stomach. In motion, he resembled a tornado lined with chain saws. At rest, he slobbered and drooled and made inarticulate eating noises (supplied by Mel Blanc, natch). His arrival was usually presaged by a stampede of widely varying species, fleeing in terror before his insatiable hunger. The most effective way to neutralize his menace was by introducing him to an even more menacing creature — a female Tasmanian Devil. Taz made only five appearances during the classic era of Warner Bros. animation, the last of which came out in 1964. All were directed by Robert McKimson, who also handled the Foghorn Leghorn cartoons and the ones in which Sylvester met Hippety Hopper, the baby kangaroo. He had a comic book, Tasmanian Devil & His Tasty Friends, published by Gold Key in 1962, but only one issue came out. He also wasn't merchandised very heavily — at first. But as those five cartoons were repeatedly shown on television, over a period of years, the character developed quite a following — rather unexpectedly, considering what a one-note he is. In 1979, a sixth cartoon was made as part of a TV special, Bugs Bunny's Looney Christmas Tales, directed by Friz Freleng (Tweety Bird, Yosemite Sam). He starred in the third segment, The Fright Before Christmas. During the 1980s, like Marvin the Martian, who also appeared only as a supporting character in five of the original cartoons, he actually became a merchandising icon. In 1990, he was used as the template for Dizzy Devil, a regular character on Tiny Toon Adventures. A year after that, he got a half-hour show of his own, titled Taz-Mania. Since it would be hard for a guy who does very little besides swallow animals whole to anchor a TV series, he was given a family and a job — which, while making him a more rounded character, kind of seems like missing the point. Those later accoutrements have since faded in memory, but Taz's six short cartoons (including the 1979 revival) are still being rerun over and over on Cartoon Network. And "Tasmanian Devil" T-shirts and coffee mugs are still steady sellers wherever Warner Bros. cartoon merchandise is sold. Text ©2002-03 Donald D. Markstein. Art © Warner Bros.